End of the 2016-17 School Year! Check back next fall for updates as Nauset Metals begins a new School Year! Have a great summer! Art Metals 1 Bookmarks Finished! Today was the last day of Art Metals for the year and most students have finished their bookmarks. Two of these students were Olivia Fitzgerald and Emily Sanders. In order to complete their bookmarks, they removed the excess solders and then finished the metal by polishing it. Emily and Olivia are glad that they finished their bookmarks. They both say it was a very rewarding experience. Overall, the Art Metals 1 bookmarks were a success! 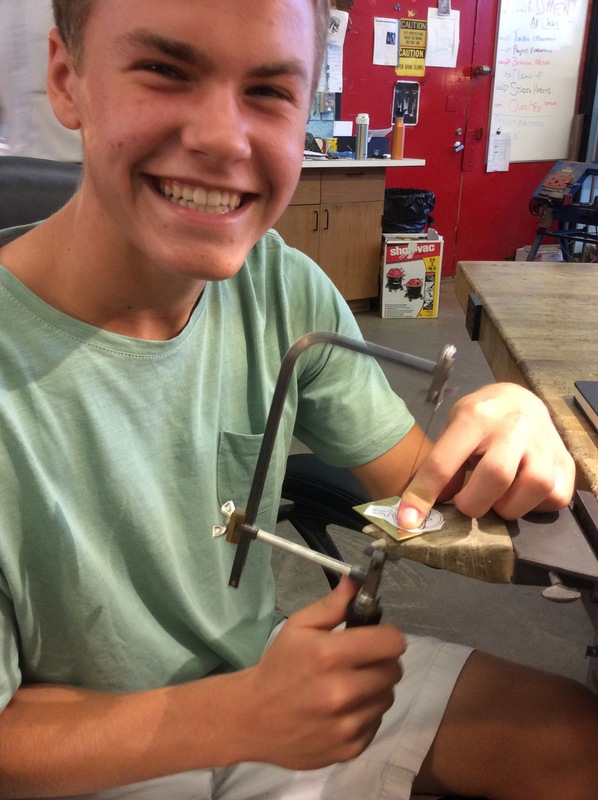 Today, in the Art Metals 1 class, some of the students soldered the frames of their bookmark to the top pieces. Emily Sanders was one of the students. I asked her a few questions about what she is currently working on and when she hopes to finish the bookmark. Emily, what are you currently working on? I have just finished soldering my frame to the top of my bookmark and now I am preparing the bottom of the bookmark to be attached. I have cleaned it by pickling it and now I am filing the bottom piece so that it will fit with the top. Next, I will solder the base of my bookmark to the top of the bookmark. I am about to do this right now. Hopefully, before school ends. We have 2 more classes. Shortly after I talked to her, Emily completed the next step of the process by soldering the bottom of the bookmark to the top. I asked her questions about this as well. What have you just finished doing? I have just finished attaching the base of the bookmark to the top by soldering the two pieces together. No, not really, it took me less than 5 minutes. Yes. It was easier than expected. Now, Emily must simply finish the metal of her bookmark and she will be done! Check back soon for the last bookmark process post. The students are continuing to work on their bookmarks as they hurry to finish them before the end of the school year. The above bookmark was created by JT Tulloch. He is now preparing to solder the frame to the top of his bookmark. Many of the students in his class are also at this stage in the process of creating the bookmarks. Check back soon for another process post! Art Metals 1 Learns to Solder! Today, the B2 Art Metals 1 class learned how to solder metal. Soldering is a complex skill but is essential in art metal. Soldering uses a torch to melt metal called solder onto two pieces of metal in order to connect them. Mr. Craven also taught the class how to use the pickle after soldering. The pickle is a pot of acid that removes oxidation and flux from newly soldered metal. With these skills, the students will be able to continue the creation of their bookmark by soldering the frames to their bookmarks. Many of the students will try this new skill today. If you would like to learn more about soldering and how it is done check out the soldering post under techniques! This year’s fine and applied arts nights were a huge success for all of the arts departments at Nauset. The show included garmets made by the fashion design classes, paintings, sketches, photos, prints, sculptures, pottery, furniture made in woodworking, jewlery and art metals pieces, and more! The Nauset Metals department was well represented at Fine and Applied Arts Night, with the majority of the pieces made this year on display. Below are some of the highlights of the metals department of the show. Fine and Applied Arts Night 2017 at Nauset is this Wednesday and Thursday from 5:30-9:00 at the high school. Many pieces from the Nauset Metals program will be on display, including earrings, metals of honor, rings, perfume bottles, bookmarks, sculptures, necklaces, independent projects and more! Be sure to come check it out. 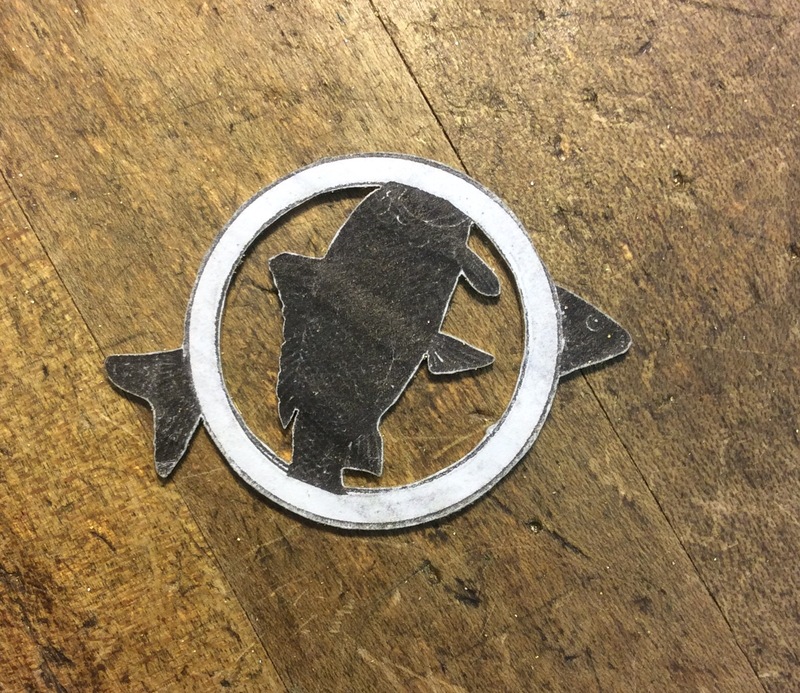 Today in Art Metals 1, some students began to cut out the designs they created for the top of their bookmarks. JT Tulloch was one of these students. I asked JT a few questions about his design inspiration and the process of creating the bookmark as he worked. JT, what were you inspired by when you created your bookmark? I go boating a lot in the summer and we see a lot of whales. Whales have always interested me so I decided to create a bookmark that pertains to my life. What stage are you currently at in creating your bookmark? I am currently cutting out the top frame of the whale’s tail. What tool are you using to cut out the whale’s tail? I am using the jeweler’s saw. Do you plan to use texture on the tail? Yes, I plan on texturing the frame so that the whale’s tail will continue onto the edges of the frame. Do you have any experience with using textures? 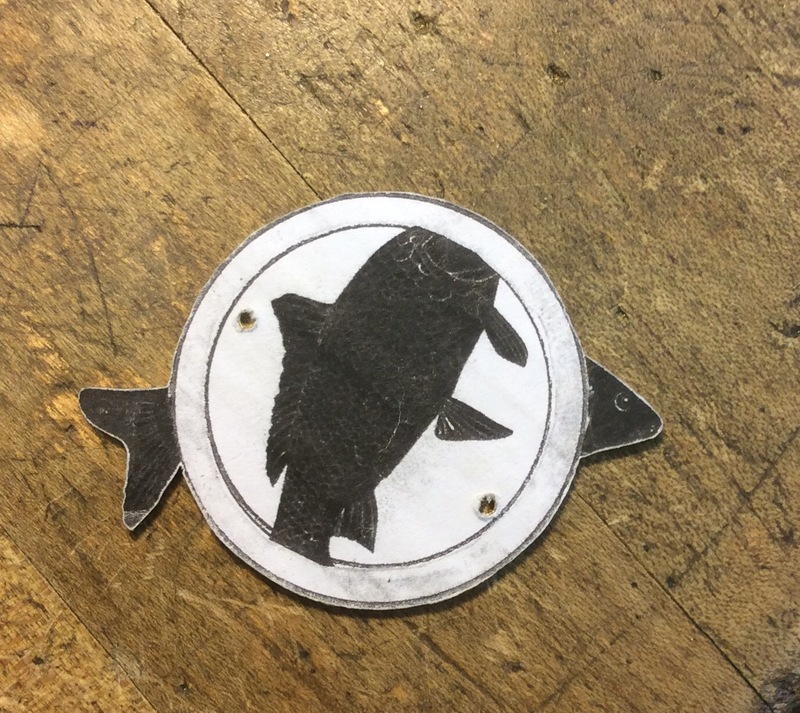 Yes, I recently finished creating a stripped bass keychain and the face, gills, and tail were all textured. The next phase of this process will begin once the students finish cutting out the tops of their bookmarks. Be sure to come back and check it out! 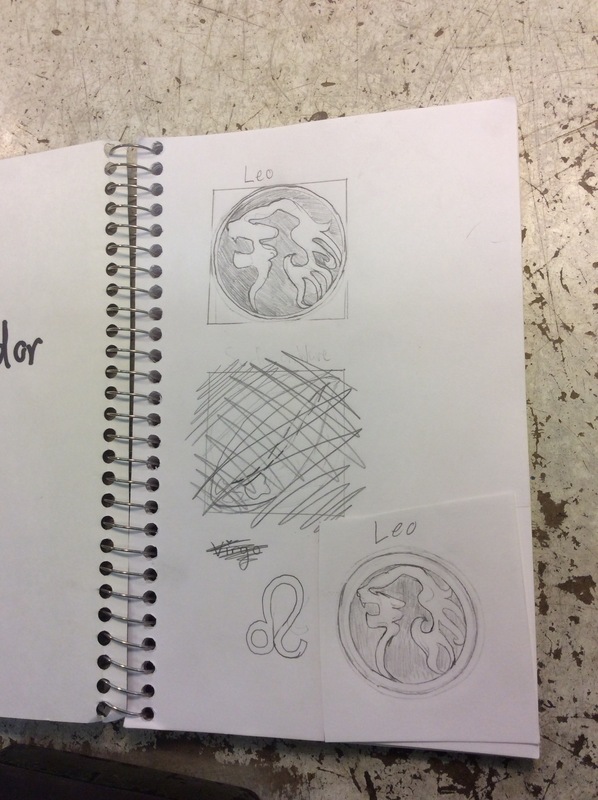 Today, many of the art metals students with completed designs began the process of creating their bookmarks. The students were instructed to create a bookmark inspired by either a novel or a scene from nature. Olivia Fitzgerald was the first student to begin working in metal on her bookmark. I asked her a few questions as she began the process. Olivia, it appears you are in the beginning stages of creating your bookmark. What is the first step? The design process is very important. And what was the inspiration for your design? My bookmark is based on Beauty and the Beast. I was inspired to create this bookmark because I recently saw the new Beauty and the Beast movie. The top depicts Belle and the Beast looking at the rose. And the bottom has Lumiere the candelabra. I just taped my design to the metal and I am about to drill holes in the piece so I can begin cutting out the negative space. These were the first stages of creating the bookmark in Art Metal 1. Be sure to check out the posts to come as the students progress towards completing this major project. A new student will be featured every post! From April 5th until April 25th, pieces from the Nauset Art Department will be on display at the Snow Library in Orleans. 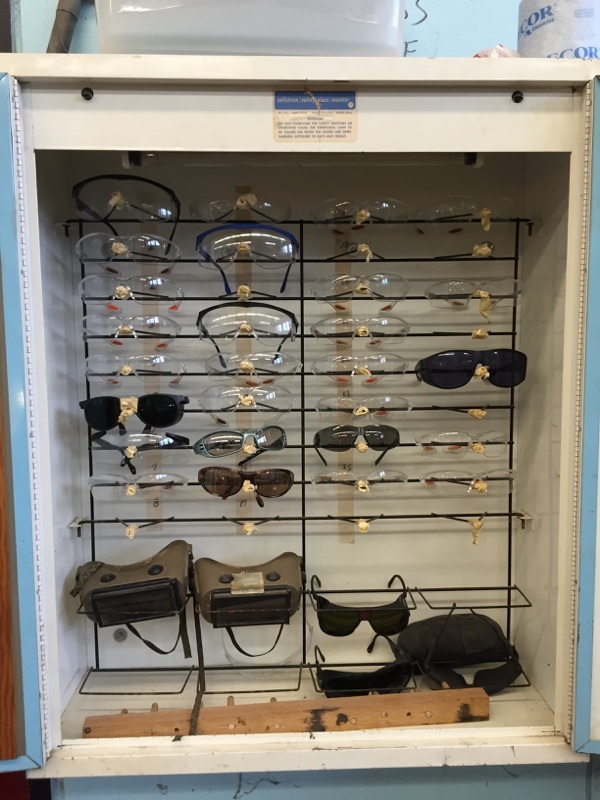 This display will include many works from the Nauset Metals Department, which will be located in the entryway display case. Many of the pieces on display are from the Jewelry 1 and Art Metal 1 classes, while others are from advanced students and have recently won awards in the Boston Globe Scholastic Art Competition. Below is a piece by Jackson Stockdale which has recently won a gold key in the Boston Globe Scholastic Art Competition. This piece will be on display along with many others. Fiona Edwards, a senior, is a very accomplished metals student at Nauset. She has been taking metals classes for three years and is now an independent study. Today we sat down with her to talk about her time with the Nauset Metals department, the pieces she has created, and the piece she is currently working on. What metal classes have you taken? I have taken Art metal 1, Jewelry 1 and Jewelry 2. When did you take your first metal class? The first half of my sophomore year I took my first metal class, when I took art metal 1. I had previously worked with clay but working with metal soon became my favorite medium. I was excited to learn about a new way of creating art and soon knew that I wanted to continue taking metals classes at Nauset. What is your favorite medium to work with in art metal? My favorite mediums are copper and sterling silver but I use copper more often because it is very malleable and I love the color and tones it gives to a piece. As you are a senior, do you plan on continuing to work with metal? I am going to University of Rhode Island where I will pursue a Biology major but I plan on continuing to create pieces because I had such a wonderful experience learning in this class. Tell me about some of your favorite pieces that you have completed. So far, my favorite piece is my dragon ring which is a lost wax casted sterling silver ring with an emerald set into it. I learned how to create this ring in my Jewelry 2 class last year, where I began working on it. I then continued to work on it as an independent study and completed it in November. I entered this piece into the Boston Globe Scholastic Art Competition and it received an honorable mention. 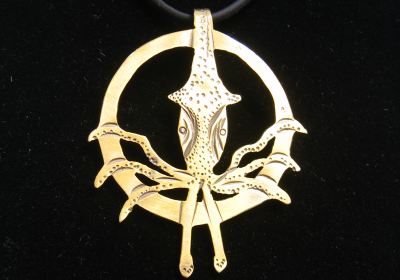 The second piece that I completed this year was my octopus pendant. I created it through a process called chasing repoussé and finished it by setting it with opal cabochons for eyes. I enjoyed making this piece because I was able to learn a new way to form metal. My octopus also got an honorable mention in the Boston Globe Scholastic Art Competition. Right now I am working on creating a dragon sculpture. So far I am in the process of finishing the head. The entire piece is going to be be made primarily out of copper and right now I am trying to create a tongue made out of brass, so that when the jaw swings the tongue will lift up and be seen. Before I went to metal, I started planning how the dragon would look by first creating a 3-D design out of paper which I modified and made a second paper dragon, which I am now using as a reference as I create the dragon out of metal. Why do you like to make dragons? I grew up reading countless fantasy books including the entire Chronicles of Narnia series before fifth grade. I like making dragons because when you think of the fantasy genre, dragons are one of the first things that come to mind. Also dragons and their anatomy are very interesting to design and create. Do you have any advice for people who are considering taking metals courses? I would recommend metals classes to anyone who is interested in learning about a new way to create art. One of the most important things to remember when taking this class is to retain the processes taught because you will use them in later classes. Art Show at Orleans Town Hall! During the month of March, five metals pieces made at Nauset have been on display at the Youth Art Show at Orleans Town Hall in celebration of National Youth Art Month. Tomorrow, Friday March 10 there will be a reception at Orleans Town Hall from 5:00 to 7:00 PM. Can’t make it? You can still come see these amazing pieces at Orleans Town Hall through the end of March. The first set of half-year jewelry and metals classes have recently completed. 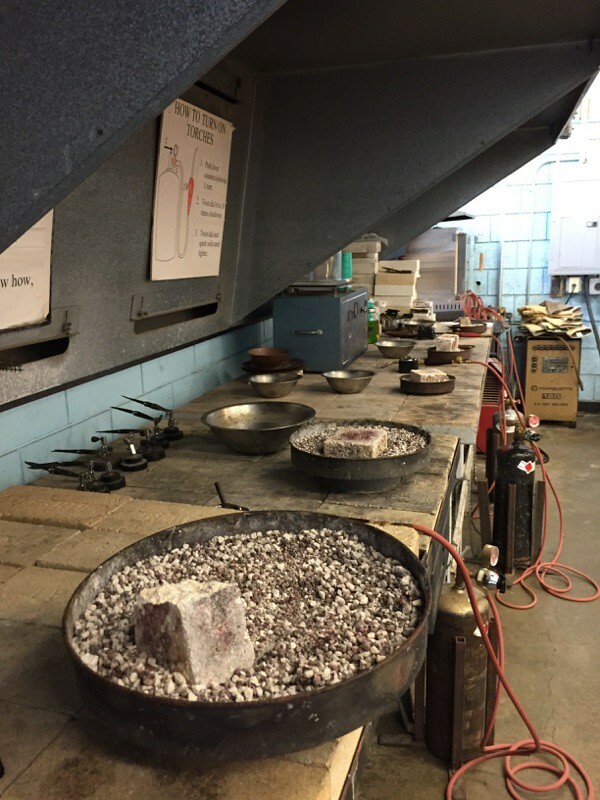 Many students in the jewelry 1 class began with no metal experience at all. Leaving jewelry 1, students are able to comfortably cut metal using a jeweler’s saw, use and change a drill press, file metal using a variety of different files, polish metal, finish metal using petinas, form ear wires with pliers, ball wire, rivet pieces together in multiple ways, set stones and even solder. It is clear that these students learned so much considering they only took a half-year class. During the jewelry 1 class, 3 projects were completed. The first was a pair of earrings, the second was a metal of honor, which was a pendant or pin students made to honor a loved one, and the third was a ring made with a bezel set stone. 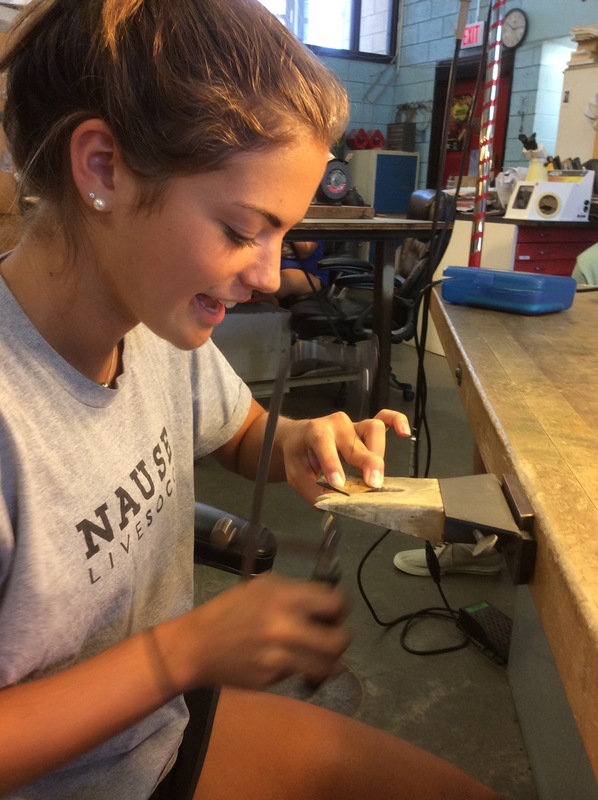 Many of these first-time metals students were intrigued by the processes learned during Jewelry 1 and will continue to take more metals classes throughout their years at Nauset. The Nauset Metals program is a great opportunity for students to learn a new art form and skill that most are never exposed to. 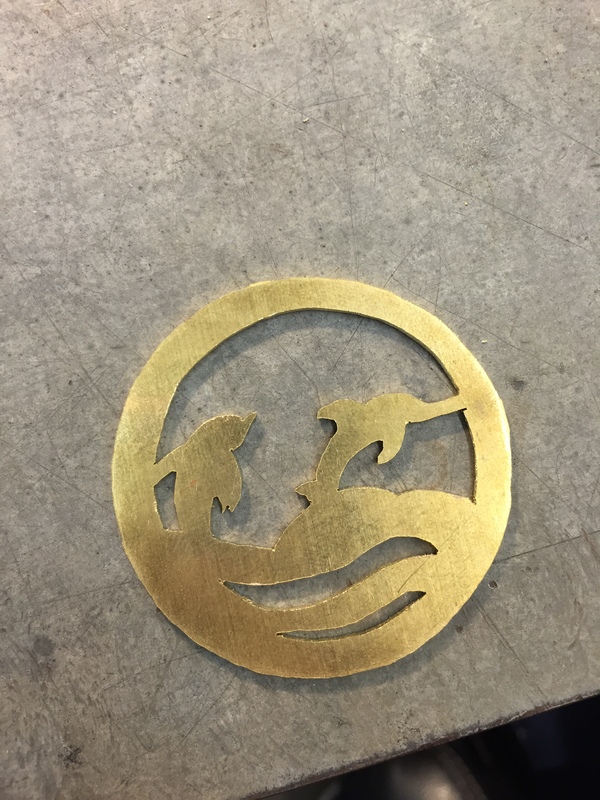 If you are considering taking a metals class, such as jewelry 1, know that metals classes are best for creative students that like art and like to work with their hands. Attached are pictures of a few of the earrings completed during the fall semester Jewelry 1 class. More can be viewed in the photo gallery section. The following entries from the Nauset Metals department have won either a gold key, silver key, or honorable mention in the 2017 Boston Scholastic Art Awards. This year’s submissions for the 2017 Boston Globe Art Awards from the Nauset Metals department. The Nauset metals program put together another amazing showing in this years Fine and Applied Arts Night. Work from all metals and jewelry classes filled four display cases. Below are some examples of the work that was displayed. Congratulations to all the artists and art teachers on a successful show! The first step to making earrings with bezel set stones is to find how much material you need for your bezel and then determine how high you need the bezel to be. To find how much metal you need for the bezel you need to find the height and circumference of the stone. My stone’s height was 4.5mm and the circumference was 37.68mm, so I needed to cut a strip of metal for the bezel a little bit bigger so after it is filed the size will be right. Once you have the amount of metal you need, you form the bezel using a bezel mandrel to get it to the shape you need. After it is formed you solder it together just like you would solder a ring. Once the bezel has been formed and soldered together you need to sand it down so it fits the stones height perfectly. Making sure it is high enough to hold to stone but low enough so you can see a majority of it. Next you drop the stone in from the top of the bezel to make sure it fits. After the bezel is finished it is time to make the backing piece to the size and shape that you would like. The bezel will then be soldered on to the backing piece to hold the stone in place. You will want to leave enough room on the outside of the bezel for texturing. When you solder these two pieces together you must be sure that both sides are clean to be sure that the solder is going to flow all the way around the piece. Then you will want to flux the side of the backing piece that you want the bezel to be attached to, the bezel itself and the solder. For this part of the earring you will want to use medium solder so you are sure not to open up the solder seam that is on the bezel itself or melt any of the silver. The next step is to make and attach the tube set stone. To set the stone in the tubing you first need to find which tubing the stone is the closest to fitting into, then you drill out a shelf in the tubing with the flex shaft for the stone to sit on. The stone must sit low enough so it doesn’t fall out and high enough so you are able to see most of it. Then you set the stone in the tubing using a burnisher and holding the stone in the flex shaft. Once the stone is in place and sanded down to fit on the side of the piece, you attach the tubing to the side of the earrings. To do this you need to use easy solder and heat from the back of the earring to not melt the bezel on the front. After the stone is attached on the side and the earring has the finish you want, you set the bigger stone in the center. This stone is set using a bezel pusher and a burnisher. Once this stone is set it is time to make ear wires. The ear wires are made by balling the end of the wire then bending them with pliers so the earring doesn’t fall off and doesn’t hang too low. The final step is to put the ear wires through the earrings, then they are complete! For the month of April the students of the Arts Department at Nauset Regional High School are able to showcase their pieces at Snow Library in Orleans. Many of the pieces shown at the Snow Library are from the metals and jewelry program and some have even recently won awards in the Scholastic Art & Writing awards. 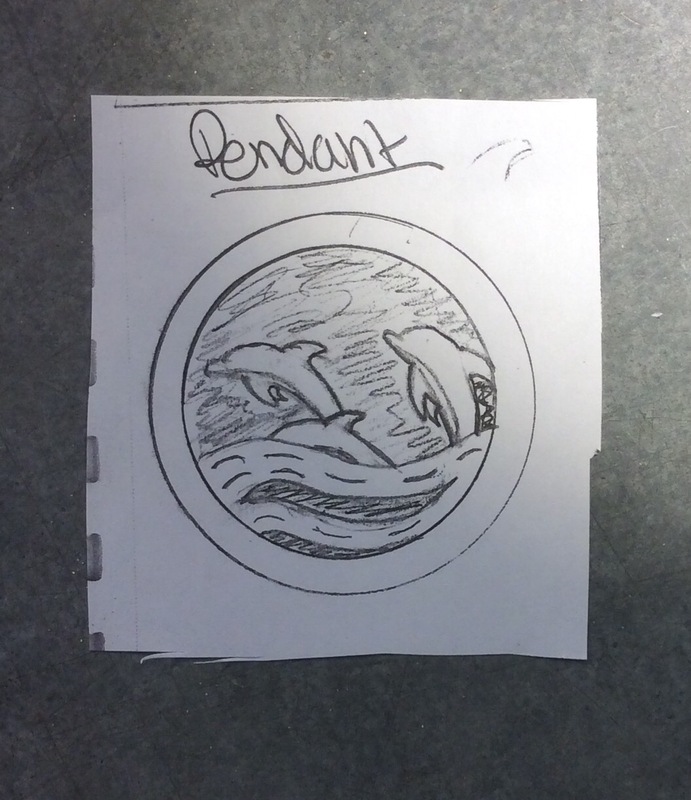 Below is a locket made by Ben Pickard, a junior at Nauset, that is being displayed in the exhibit. First you must pick what size you need in order to know how much metal to use for the band. For my ring I needed a size 5 so that is 16.10 mm of metal.Then you need to form the band around a ring mandrel and solder the ring together once you know the size is right. After the band is made that is when you finish forming it with a hammer on a mandrel, you can also add a texture using either a hammer or stamping tools. Next is the bezel for the stone. To find how much metal you need for the bezel you need to find the height and circumference of the stone. My stone’s height was 4.5mm and the circumference was 37.68mm, so I needed to cut a strip of metal for the bezel an amount larger so after it is filed the size will be right. Once you have the amount of metal you need, you form the bezel using a bezel mandrel to get it to the shape you need. After it is formed you solder it together just like the ring. Once you are certain that the bezel fits your stone’s shape you now pick a backing piece for the bezel, that will also be soldered together. After it is attached to your bezel you will want to decide what shape to leave around the bezel for a shadow line then cut it with a jewelers saw. After the bezel is made and is filed or textured it is ready to be soldered on to the ring. Before you attach the two pieces the ring must be filed down flatter in the spot where you would like the bezel to sit. When soldering the bezel to the ring you must place solder on either sides of the band and heat from the top. Once the bezel and the band are attached it is time to set the stone. When setting the stone you need to use the grs to hold the ring, to allow the ring to move in the direction you want. A series of tools is needed to set the stone, first a bezel pusher, then a burnisher to add a finish to the bezel. Then when the stone is set you will want to add a final finish to the ring with the buffing wheel. After this step you will have a finished ring! All of the artwork shown below has received either a gold key, a silver key, or an honorable mention in the Boston Globe Scholastic Art Awards. This years submissions for the Boston Globe Scholastic Art Awards from the Nauset metals program. All artwork photographed by Ellie Hartmann. The jewelry one class has completed the final touches on their earrings and are ready to be displayed. Be sure to come check them out during our Fine and Applied arts night in the spring! 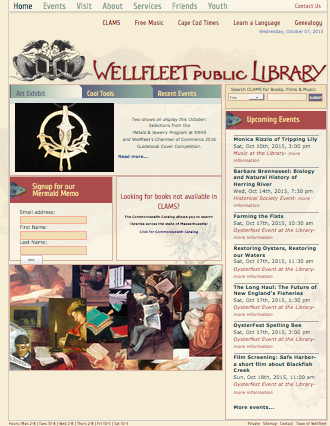 During the month of October the Jewelry and Metals program is holding an art exhibit at the Wellfleet Public Library. A variety of different projects are being displayed in the Library’s display case. The students projects show the advanced metal program Nauset has to offer and the many techniques they have learned and put to use, to create impressive advanced work. The show is a great opportunity for the student to share with their work with the community. The jewelry one class is starting their first major project, earrings! 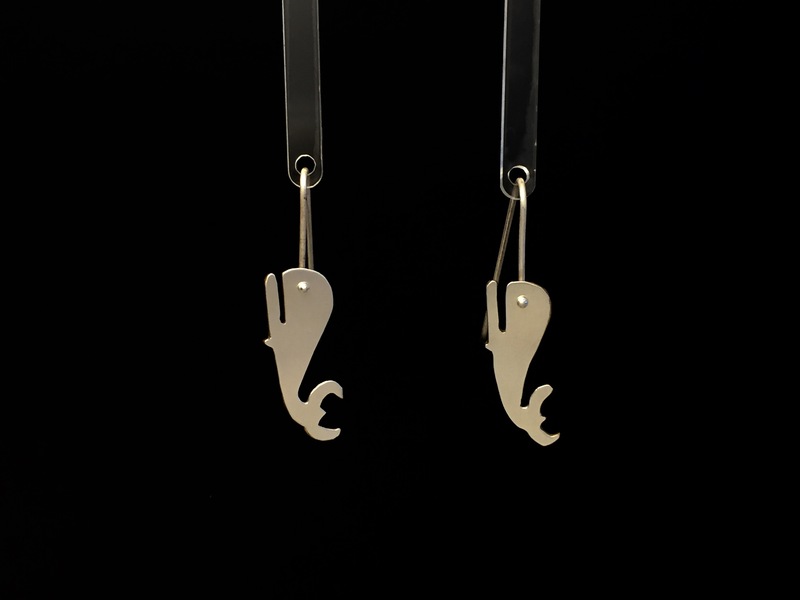 They will be given two pieces of 25mm by 11mm silver plated bronze, to create their earrings. For this project the major tool being used is the jeweler’s saw. A few more advanced students are planning on incorporating simple textures onto their earrings. The students will be moving their designs to metal very soon! Lane is a junior independent study in the metals program. He recently shared the plan for his latest project. 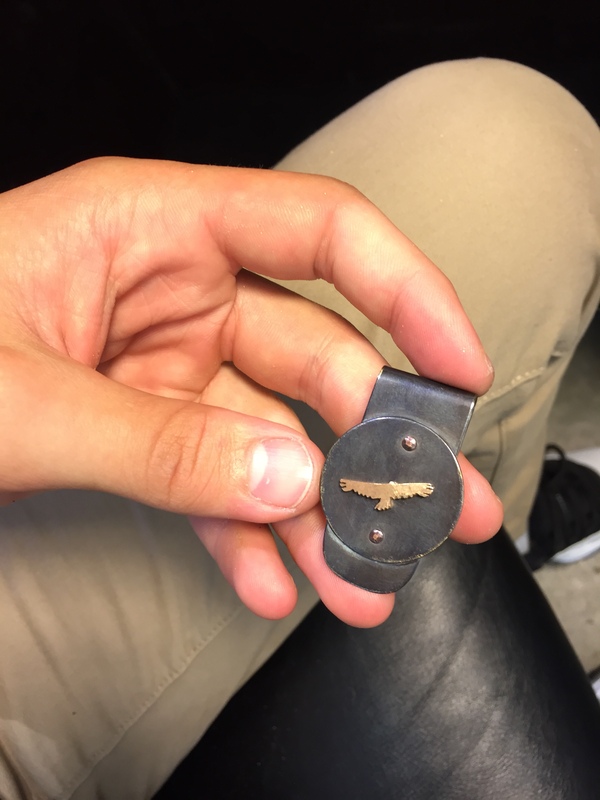 Lane is in the process of finishing a money clip, and is working on creating matching cuff links. He is using brass and dying it with a black patina. Both pieces will include the same image of an eagle. Stay tuned for the Lane’s finished projects! 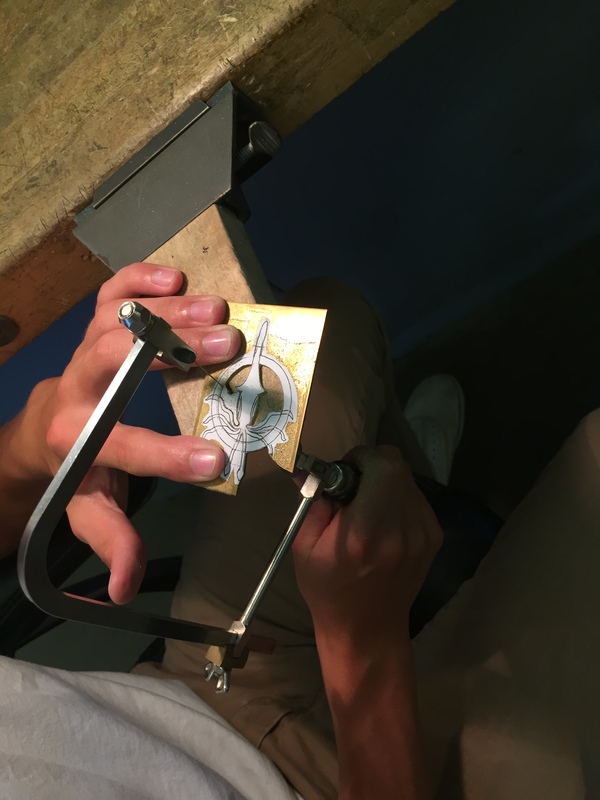 This jewelry one class is a combination of new students and more experienced students who have taken art metal one the previous year. 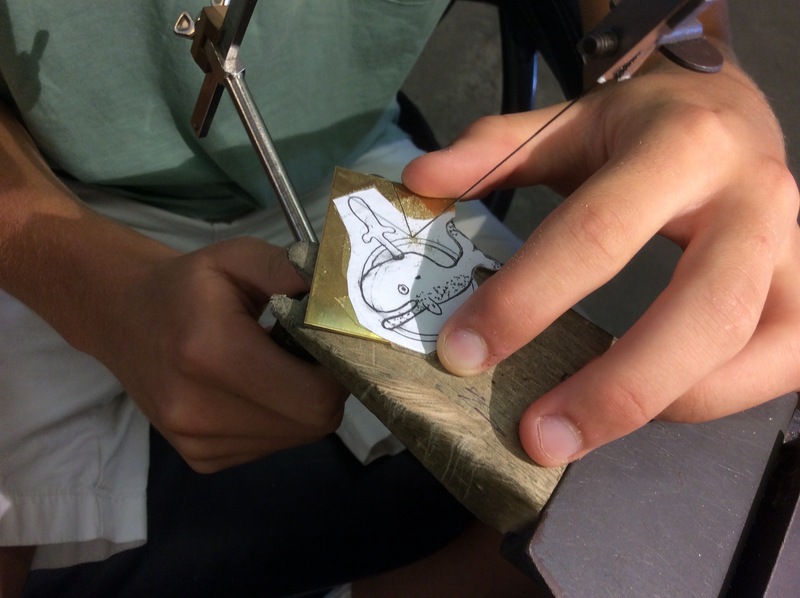 Due to the varied experience levels the students are working on either learning how to use the jewelers saw, or using skills they already have to complete a piece. The qualifications for the piece were that it needed to be made out of a 2inch by 2inch piece of brass, it needed to incorporate negative space, a bail for it to hang from, and it must be wearable. It also needed to include a stamped texture. Before they started cutting their designs needed to be approved by Mr. Craven. Below are pictures of a variety of the students designs. Stay tuned for their finished products! A preview of the many professional tools and supplies available in our studio. 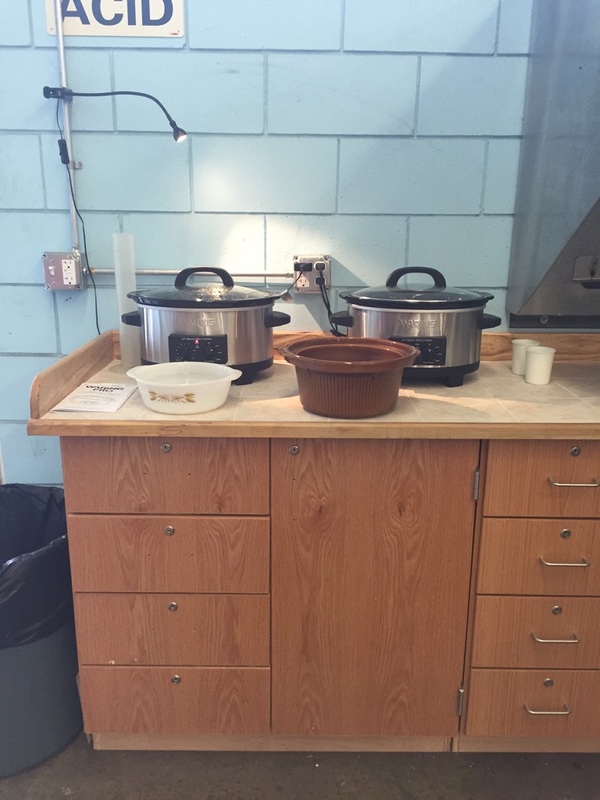 The Nauset Metals and Jewelery Department is off to a great start to the 2015-2016 school year. Very exciting new projects and designs are on their way to be shared with you. Many students are looking forward to their success in the department this year, from new students in the art metal one class, to returning students who have decided to take an independent study. Be sure to check in through out the year to see many creations from our Nauset students. The class of Jewelry 2 recently completed the casting of their wax rings. Their wax-molded rings were attached to a sprue. Students then painted ‘Wax Clean’ to get the air bubbles off of the model. They then attached it to the button, and then attached it to the flask and then took investment and added water. Then students to put it on the vacuum to get the air out. The investment was then dumped into the flask, put back in the vacuum, taken out, and let sit for 24 hours. Students then put their rings in the kilm, face-down so that all the wax melted out. 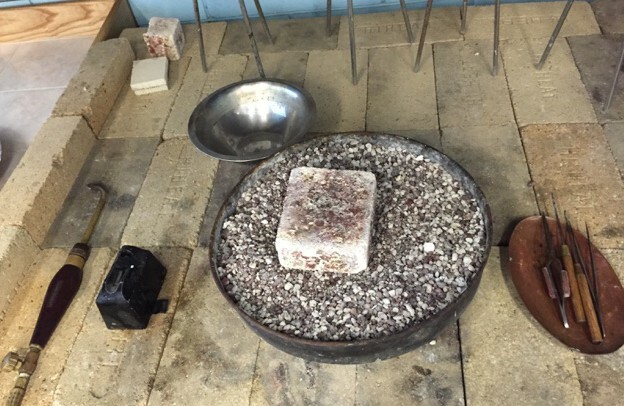 Silver is melted in the crucible, dumped into the cast and put on the vacuum, then quenched till the investment falls off. Students then pickled their rings, cut off all the sprues and are currently finishing their rings. Above are pictures from the entire process, be on the lookout for the final product from Jewelry 2 Students! The Nauset Metals class wrapped up another Fine and Applied Arts Night, with an amazing showcase that demonstrated the talents of the students of the various classes. Below are some of the works displayed in the showcase. Congrats on another awesome Fine & Applied! 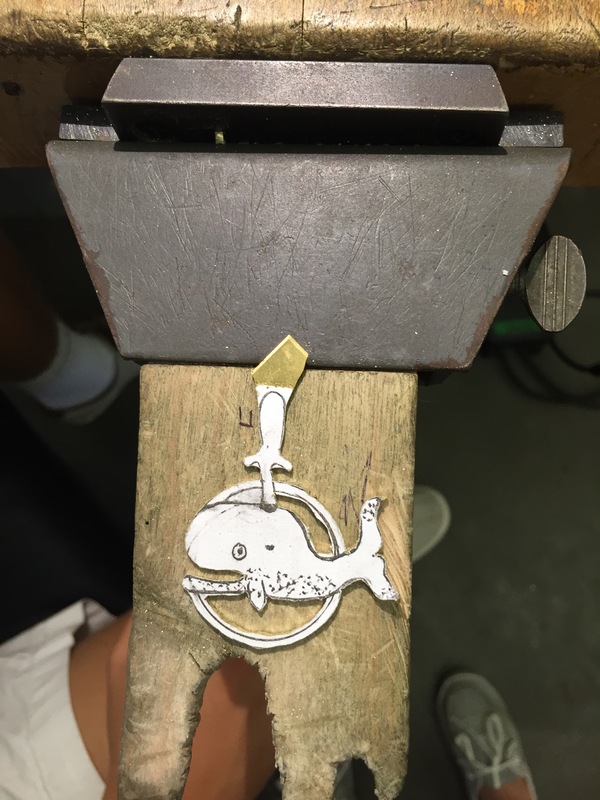 Students of the Jewelry class recently finished their latest project, Medals of Honor, in which they incorporate different symbolic images into their design to make it more meaningful. Below are some of the different creations from the students. In the second semester of her junior year, Jetta Cook, along with another junior Silas Watkins, set out to do the impossible: set up the 3D printer that no one else really wanted to touch. Fast forward a year later, and Jetta’s excited about the possibilities now that she’s mastered the 3D printer. 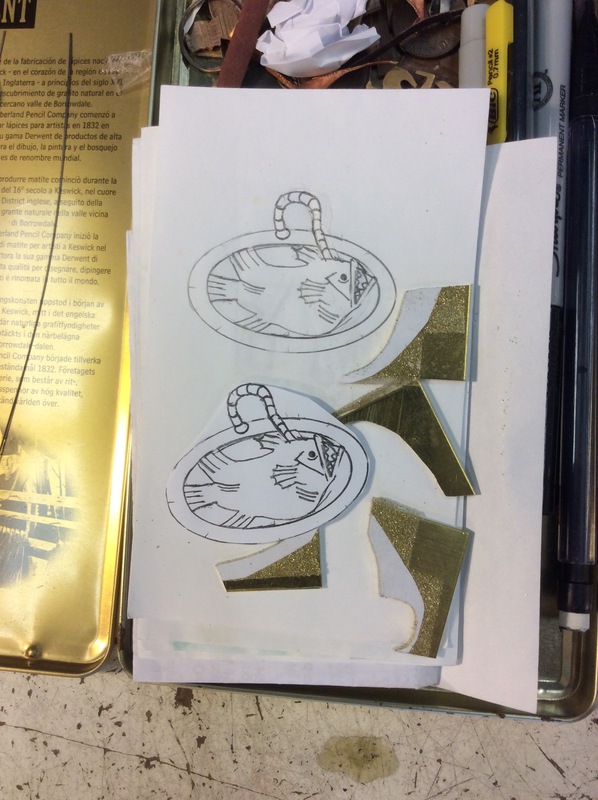 Jetta is currently working on a 3-D printed locket, just one of the many projects she has created this year. Check in to see more of the stuff that Jetta is working on! 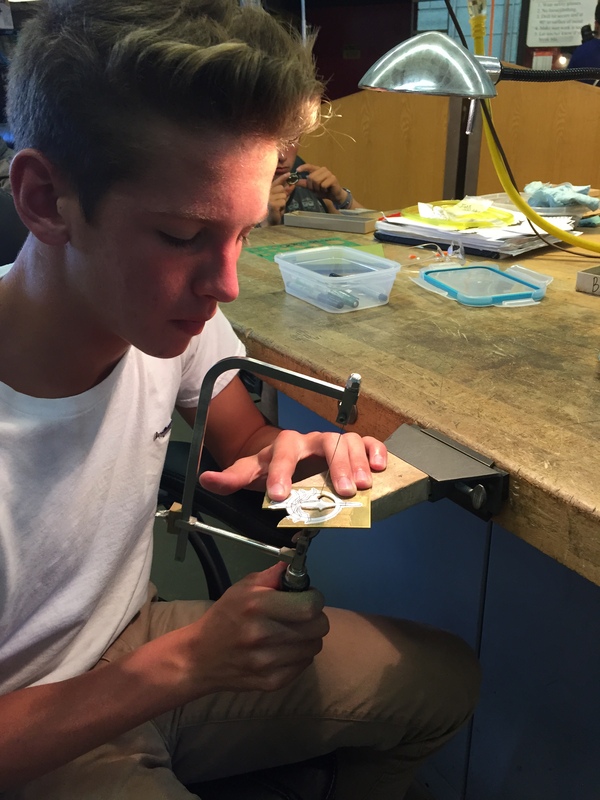 Check back in to see some of the finished lockets from Jewelry 2 students! The students of the Jewelry One class have completed their projects of the first term. Below are some of the selected works from students in the class. Below are the winners of the 2015 Boston Globe Scholastic Art Competition. 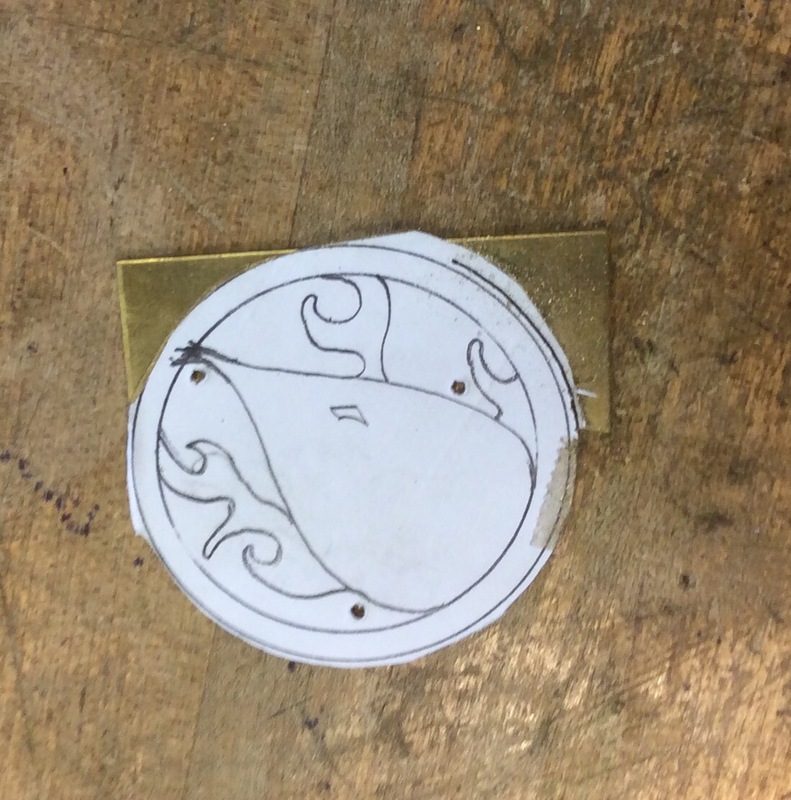 In a previous blog post, Shay Rego, a junior in the Metals Department, showed us her unfinished pendant that she was working on for her mom, shown in the picture below. Her finished product is the picture on the right, with a nicer shine and the beautiful jewels she set. She added the bail as her final addition. We’ll keep you updated on other independent study projects as we approach the end of the first term! 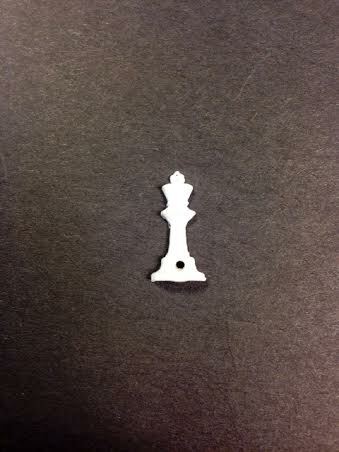 The 3D printer was put into action through the creation of this small chess piece, pictured below, for junior Soleil Cole-Olson, in the creation of her Medal of Honor for Miles Tibbets, a student who passed away in August of 2013. A chess club was created in his honor and the piece was created and made through the 3D printer. Keep checking up on the blog to see new creations from the 3D printer! Mackenzie Dubois, a junior independent study in the Metals Department recently gave Craven the best Christmas gift ever; his very own novel! Mackenzie transformed the classic “How the Grinch Stole Christmas”, to a more modern version. Merry Christmas from the Metals Department! Below are the recent submissions by the Nauset Metals students for the Boston Scholastic Art Competition. Jetta Cook, one of the coolest and most talented people in the department, recently embarked on a journey all her own; handling the 3D printer. Titled “Khan”, (a Star Trek reference, Jetta explains,) wasn’t exactly the easiest thing to handle. She has given the printer a life of its own and has recently created a locket, pictured below. Jetta is eager to see what else she can create throughout the year before she graduates. 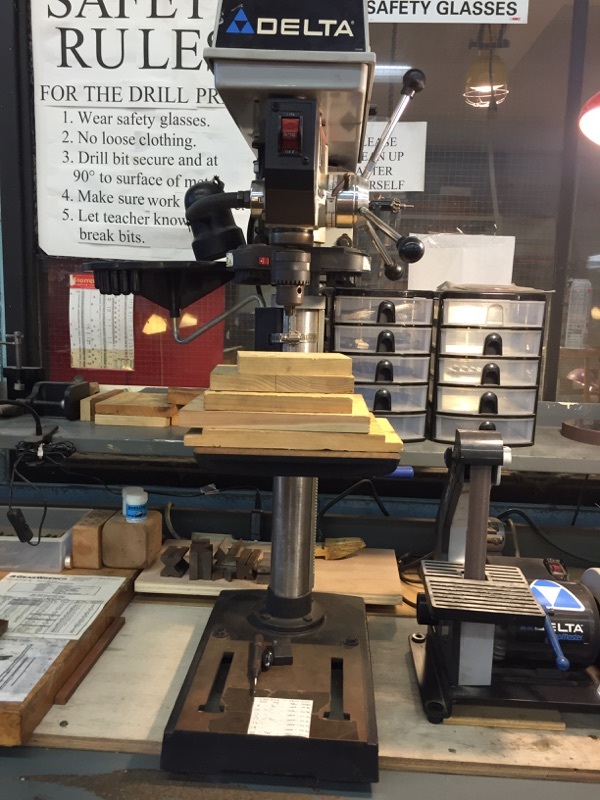 Shay Rego, a junior independent study in the Metals Department, recently gave us insight on the new project she’s working on. Q: So Shay, what are you working on? Shay: I’m currently working on a pendant for my mother. Q: Why are you making it for your mom? Shay: Well next year I will be heading off for college, and so I wanted to make her something that she can remember me by. Q: Why did you pick the Cape as your inspiration for this piece? Shay: It’s my home and I wanted a way for my mom to hold me close to her heart even if she’s not there. Check back for updates on Shay’s project! With first term ending, we begin second term with some new earrings courtesy of the Art Metal classes. Below are a sample of the creations from students of the various questions. Check back in to see their next project, Medals of Honor. Getting started is the hardest part….right? The author of this beautiful blog, was given the challenge of stepping beyond the comforts of the computer to test herself with some actual metal work. Not one to shy away from a challenge, I warily accepted with the poor assumption that I’d be able to get the hang of it. I was quite mistaken, as on the first day, even with the aide of a fellow student, I couldn’t seem get the saw blade into the saw frame, a simple procedure many other students seemed to consider a formality in the learning process. Morale was low and it looked bleak but through some encouragement and finally getting the saw blade in place, I began cutting. Craven took some pictures, shown below, to document this moment. It made me realized that the talent and ability of these students is not something to be taken lightly. Their skill and creativity displayed is unmatched to any other department. The opportunity to be able to join these students in this process is truly a great opportunity and I’m excited to see what happens. 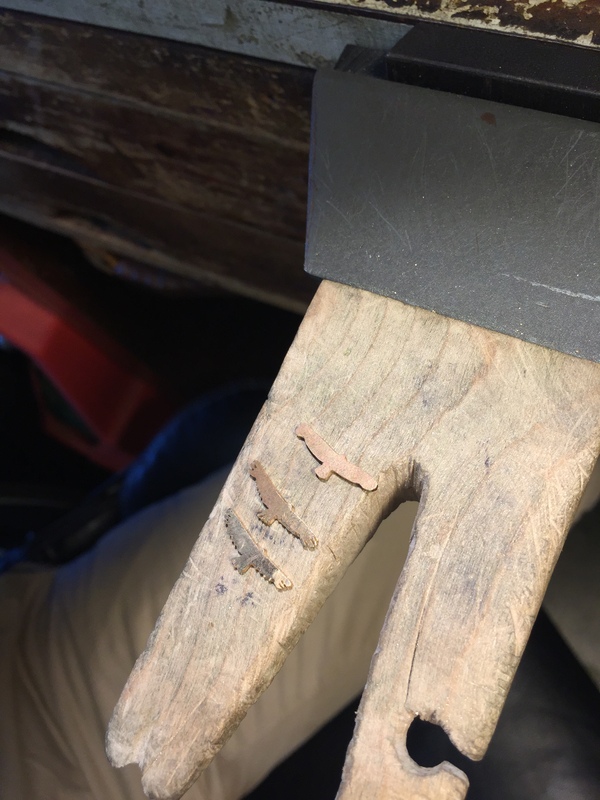 Will this blogger actually be able to stick with it or will she hang up her saw blade forever? Check back for updates on her journey and Craven’s sanity! 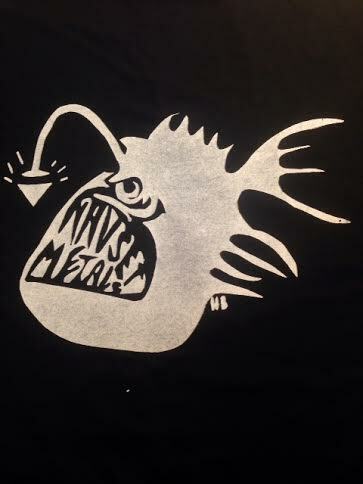 Nauset Metals T-shirts! Look like the coolest kid in school! That’s right folks, we’re thinking of bringing back the wonderfully designed Nauset Metals T-shirts that were for sale during Fine & Applied Arts Week of the 2013-14 school year. Since we don’t want to make the shirts without the demand for them, we’ve attached a poll for the viewers to vote on what they would like. Please take a chance to look at our design below as well as previous posts about the shirt then vote. A follow-up post will be featured in the upcoming weeks based on the results. Thanks for your ongoing support for the Nauset Metals Department! The Nauset Metals Department is back and better than ever! We’re excited for all of the projects and designs that’ll be created in the 2014-2015 school year. We’ve got new and exciting materials to try out, including the 3D printer, which is sure to present some interesting creations. We asked some of our students, what are you looking forward to this year in the Metals Department? Jetta Cook, senior said: Exploring the different possibilities that come with 3D printing and the application they have to metalwork. Sonya Bergquist, freshman said: Being able to wear the things that I make. 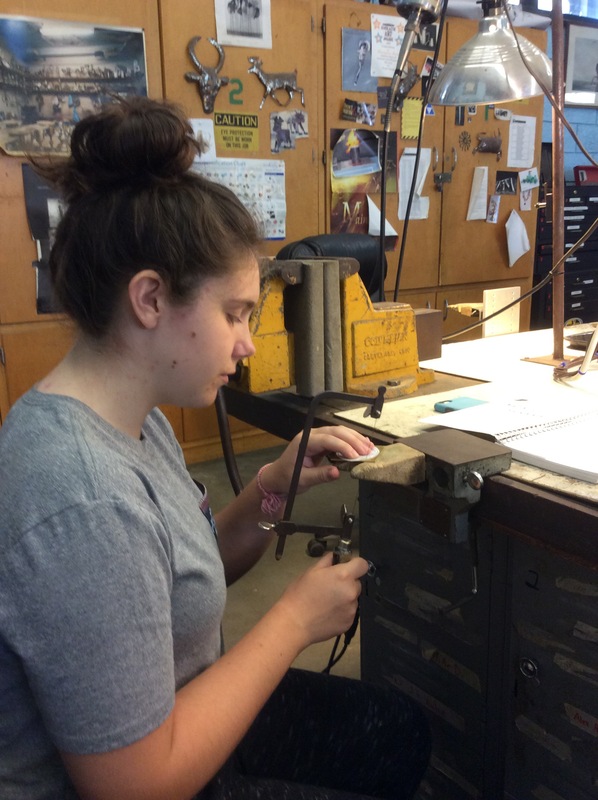 Rachel Mulcahy, sophomore said: Improving my skills with metal. Shay Rego, junior said: Advancing my techniques as an independent study. Be sure to check in on the exciting projects that we’ll be starting in the upcoming weeks in the Metals Department! We’ve had a great year in the Nauset Metals Department. The 2013-2014 year brought new projects and pieces that showcased the talents of many students, some of which are shown below. We’ll return in the fall to update you on all the exciting things happening during the 2014-2015 school year. Have a great summer!